Colorado National Monument locally referred to as The Monument is a part of the National Park Service near the city of Grand Junction, Colorado. Spectacular canyons cut deep into sandstone and even Granite–gneiss–schist rock formations,in some areas. This is an area of desert land high on the Colorado Plateau, with pinion and juniper forests on the plateau. The park hosts a wide range of wildlife, including red-tailed hawks and Golden eagles, jays, desert bighorn sheep, and coyotes.Activities include hiking, horseback riding, road bicycling, and scenic drives.There are magnificent views from trails and the Rim Rock Drive, which winds along the plateau. Nearby are the Book Cliffs, and the largest flat-topped mountain in the World, the Grand Mesa. 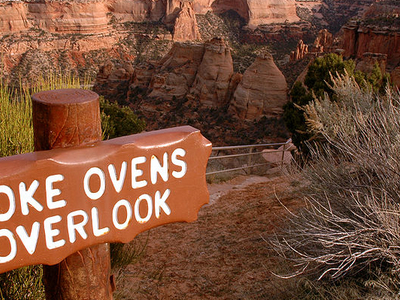 Its feature attraction is Monument Canyon, which runs the width of the park, and includes rock formations such as Independence Monument, the Kissing Couple, and Coke Ovens. The monument includes 20,500 acres (32 square miles), much of which has been recommended to Congress for designation as wilderness. The Monument contains many hiking trails, with lengths and difficulties to suit all tastes. Summer storms can cause flash floods as well as dangerous trail conditions. Rattlesnakes are found on the Monument, and rough terrain exists everywhere, but most trails are well-maintained. Winter cross-country skiing is occasionally possible on trails such as the Liberty Cap Trail. 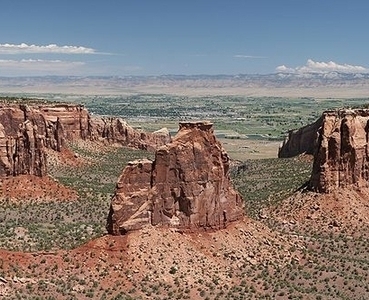 Here's the our members favorite photos of "National Parks in Grand Junction". 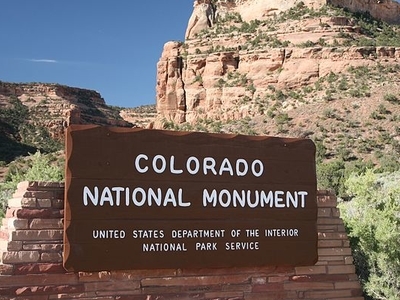 Upload your photo of Colorado National Monument!